The magnificent magnolia tree is known for its deep green leaves and large, fragrant flowers. 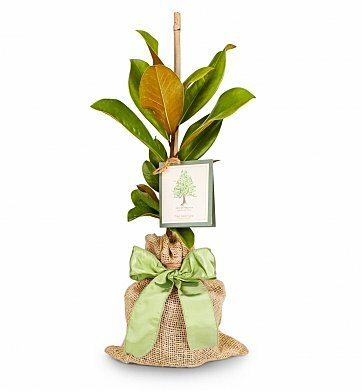 Beautiful to behold and easy to care for, a magnolia tree is a truly special gift with lasting meaning and value. Each 18" to 24" seedling comes covered in 100% natural jute with a set of care instructions, small watering tool, and gift card. Grown with great care by one of the country's most prominent magnolia nurseries. Southern Magnolia Tree is a hand delivered gift. These gifts are delivered by one of our local design centers located throughout the United States and Canada. Same day delivery is available for most gifts when ordered before the cutoff time. The cutoff time for Southern Magnolia Tree is 6 AM in the recipient's time zone. I am getting ready to order my 5th tree! My expectations have been exceeded each and every time. They all have arrived before the expected delivery date and have been incredibly well received. I love being able to come back to this company for quality service and a quality product at a great price! First off the tree arrived a day early, which was a blessing because the funeral was scheduled a day earlier then I'd expected. It arrived just as the memorial started. I was so surprised and thrilled. I simply couldn't believe how beautiful it looked. Far beyond what the picture here shows. Truly it was perfect. I can't thank this company enough for a precious gift at a very affordable price. Looks just like the photo! It was packaged wonderfully. Larger than expected, was quite impressed. Quality plant. Extremely pleased! Arrived packaged beautifully. And beautiful presentation. A lot sturdier than I thought it would be! Love it! I love the idea of planting a tree in remembrance of a loved one who has passed. Our friends who received this gift can't wait to plant it...they love it! The delivery was quicker than expected so that was a plus!